Even the mildest form of a traumatic brain injury, better known as a concussion, can deal permanent, irreparable damage. Now, an interdisciplinary team of researchers at the University of Pennsylvania is using mathematical modeling to better understand the mechanisms at play in this kind of injury, with an eye toward protecting the brain from its long-term consequences. Their recent findings, published in the Biophysical Journal, shed new light on the mechanical properties of a critical brain protein and its role in the elasticity of axons, the long, tendril-like part of brain cells. This protein, known as tau, helps explain the apparent contradiction this elasticity presents. If axons are so stretchy, why do they break under the strain of a traumatic brain injury? Tau's own elastic properties reveal why rapid impacts deal permanent damage to structures within axons, when applying the same force more slowly causes them to safely stretch. This understanding can now be used to make computer models of the brain more realistic and potentially can be applied toward tau-related diseases, such as Alzheimer's. The team consists of Vivek Shenoy, professor of materials science and engineering in the School of Engineering and Applied Science, Hossein Ahmadzadeh, a member of Shenoy's lab, and Douglas Smith, professor of neurosurgery in Penn's Perelman School of Medicine and director of the Penn Center for Brain Injury and Repair. "One of the main things you see in the brains of patients who have died because of a TBI is swellings along the axons," Shenoy said. "Inside axons are microtubules, which act like tracks for transporting molecular cargo along the axon. When they break, there's an interruption in the flow of this cargo and it starts to accumulate, which is why you get these swellings." Smith had previously studied the mechanical properties of axons as a whole. By patterning axons in culture in parallel tracts, Smith and his colleagues could apply a stretch to the axons at different forces and speeds and measure how they responded. "What we saw is that with slow loading rates, axons can stretch up to at least 100 percent with no signs of damage," Smith said. "But at faster rates, axons start displaying the same swellings you see in the TBI patients. This process occurs even with relatively short stretch at fast rates. So the rate at which stretch is applied is the important component, such as occurs during rapid movement of the brain and stretching of axons due to head impact from a fall, assault or automobile crash." This observation still did not explain to researchers why microtubules, the stiffest part of the axon, were the parts that were breaking. To solve that puzzle, the researchers had to delve even deeper into their structure. 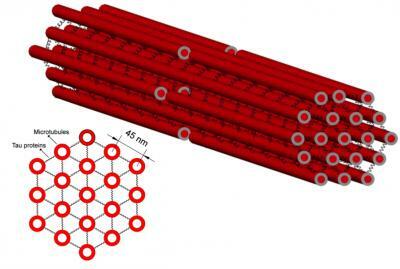 Microtubules are closely packed together inside axons, somewhat like a bundle of straws. Binding the individual straws together is the protein tau. Other biophysical modelers had previously accounted for the geometry and elastic properties of the axon during a stretching injury based on Smith's work but did not have good data for representing tau's role in the overall behavior of the system when it is loaded with stress over different lengths of time. "You need to know the elastic properties of tau," Shenoy said, "because when you load the microtubules with stress, you load the tau as well. How these two parts distribute the stress between them is going to have major impact on the system as a whole." Shenoy and his colleagues had a sense of tau's elastic properties but did not have hard numbers until a 2011 experiment from a Swiss and German research team physically stretched out lengths of tau by plucking it with the tip of an atomic force microscope. "This experiment demonstrated that tau is viscoelastic," Shenoy said. "Like Silly Putty, when you add stress to it slowly, it stretches a lot. But if you add stress to it rapidly, like in an impact, it breaks." This behavior is because the strands of tau protein are coiled up and bonded to themselves in different places. Pulled slowly, those bonds can come undone, lengthening the strand without breaking it. "The damage in traumatic brain injury occurs when the microtubules stretch but the tau doesn't, as they can't stretch as far," Shenoy said. "If you're in a situation where the tau doesn't stretch, such as what happens in fast strain rates, then all the strain will transfer to the microtubules and cause them to break." With a comprehensive model of the tau-microtubule system, the researchers were able to boil down the outcome of rapid stress loading to equations with only a handful of variables. This mathematical understanding allowed the researchers to produce a phase diagram that shows the dividing line between strain rates that leave permanent damage versus safe and reversible loading and unloading of stress. "Predicting what kind of impacts will cause these strain rates is still a complicated problem," Shenoy said. "I might be able to measure the force of the impact when it hits someone's head, but that force then has to make its way down to the axons, which depends on a lot of different things. "You need a multiscale model, and our work will be an input to those models on the smallest scale." In the longer term, knowing the parameters that lead to irreversible damage could lead to better understanding of brain injuries and diseases and to new preventive measures. It may even be possible to design drugs that alter microtubule stability and elasticity of axons in traumatic brain injury; Smith's group has demonstrated that treatment with the microtubule-stabilizing drug taxol reduced the extent of axon swellings and degeneration after stretch injury. "Intriguingly, it may be no coincidence that tau is also the same protein that forms neurofibrillary tangles, one of the hallmark brain pathologies of chronic traumatic encephalopathy, or CTE, which is linked to a history of concussions and higher levels of TBI," said Smith. "Uncovering the role of tau at the time of trauma may provide insight into how it is involved in long-term degenerative processes."